The Silhouette range of extractor fans by Vent Axia is designed for modern living. With a slim profile of only 12mm, the Vent Axia Silhouette blends in with the wall surface to provide an unobtrusive installation. Silhouette has a FID performance of 95m3/h, and is double insulated, with an incredibly low power consumption only 13 watts. Careful design means a ‘white sound’ spectrum understates the dB(A) sound levels providing optimised sound to performance output. 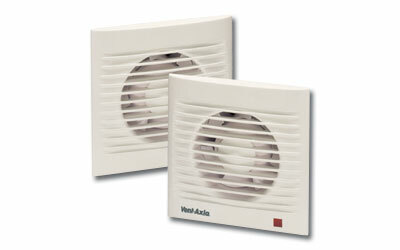 Mounted in the centre of the fan, beneath the ultra slim profile grille, are the electronics, incorporating a choice of integral control, a PIR movement sensor to activate the product when a person enters a bathroom or WC or an overrun timer option that is adjustable between 5 and 30 mins. Silhouette can be ceiling/panel mounted and connected to an appropriate duct run to the outside. fixing hole diameter 115mm when wall kit is used.